Criminal activity: Video analytics systems aren’t designed to replace police officers, they’re designed to arm them with intelligence so that they can take fast action. Today’s systems enable police to complete investigations up to 10 times faster, observe multiple locations at once and condense hours of video footage into minutes. Video Content Analytics (VCA) allows police officers the ability to search by gender, vehicle, colors and more to narrow down searches. This allows law enforcement to more quickly apprehend suspects, monitor points of interest for criminal activity and better work to keep cities safer. Streamlined emergency response: Often times, law enforcement is reactionary, not proactive. But with video analytics systems, smart alerts can be arranged so that police can be notified of potentially threatening activities as situations develop, thereby permitting faster response times. An effective analytics system can work as a viable extension of a police department. Pedestrian/vehicle traffic analysis: Video analytics also plays a big role in analyzing both pedestrian and automotive traffic patterns. This can help city planners learn of any troublesome intersections or why traffic congests in certain areas, and help them develop solutions to keep traffic moving better. It also a lows planners to analyze pedestrian walkways and biking paths, properly assess their safety and determine if any signage or traffic lights need to be added in identified problem spots. Crowd control: Is there a convention center in your city? A sports stadium? A concert venue or outdoor amphitheater? In areas of a city where heavy pedestrian traffic occurs during confined periods of time, crowd control becomes very important. Video analytics can help building managers and city planners better assess and streamline safe entry and exit from venues. Thanks to rapid review and search features, such systems can also help identify and reunite lost children with their parents faster. Aside from promoting safety, there are also facility benefits. Building managers can assess what areas receive the most traffic and position concession stands, event workers and retail outlets accordingly. 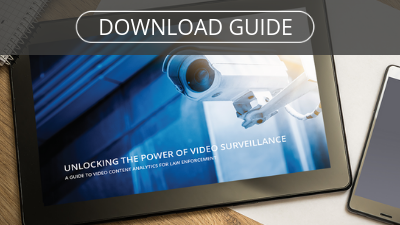 Video surveillance is extremely valuable, and it can become even more valuable with comprehensive video analytics. When it’s utilized properly by law enforcement, city officials and other professionals, a comprehensive video analytics system can help cities become safer and more efficient. Ultimately, this all goes toward making the city a more desirable place to live – a win for residents and for city officials.